Well this little fellow "Andy" is the reason for this page. 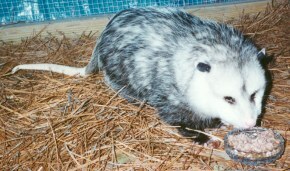 He was the first opossum that I ever got in to rehab. He was thrown from his mothers pouch when she was hit by a car. Some kids found him wandering by the side of the road and picked him up. After they had him for 24 hours and could not get him to eat, they called me. 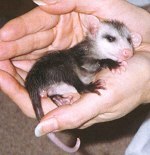 I was scared to death to take him as I had never raised an opossum before. 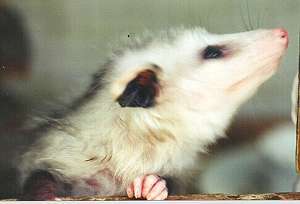 I had to get on the phone and call our groups' expert on opossum to see what to do. I offered to let her have him to raise and she told me that this little fellow would be a good experience for me and since it was only one, I could take my time with him and learn. So this is my rehab story for "Andy". When this little guy came to me he was so small I was scared to handle him for fear of injuring him even though he was bigger than most squirrels I had ever held. At least he had fur and his eyes were open. My first job was to get him warm and rehydrated since I knew he had been without food for at least 24 hours. I fixed him a box with cloth baby diapers and baby receiving blankets and placed half of the box on a heating pad set on "LOW" and had the heating pad wrapped in 2 layers of toweling so as not to overheat the little guy. I prepared him a formula to drink after I had him rehydrated and could not believe I got him to eat. To make a long story short, it was not long til I had him on solid foods but was still offering him formula to drink in addition to his solid food and water. I would also weigh him on daily basis on a set of digital scales that I have to keep up with his weight gain. Everything that I take in is weighed once a day and the weight is recorded on a chart, something similar to when you go to the doctor and the doctor records your height and weight. This is the only way I have of making sure that they are making progress and growing. While he was still little, I would play with him and let him climb on me. Most of the time he would get up on my neck under my hair and he would grap fists full of my hair and hang on, just like he was hanging on to his mother. Most of the time I had to get my husband to come and pry him loose when it was time to put him up. I did not realize that being so little he would have such a grip, but they do. Now that I think about it, I guess they have to hold onto momma when they ride on her back else they would get left behind. I will say that this little fellow was very clean. Some opossums can be trained to use a litter box, but I never managed to accomplish this with this little guy. But at least he did have one specific place that he would do his business. Well here he is in his box "resting". When I saw him looking out of his box at me I could not resist this picture. I had come in the room and called his name and there he appeared, looking at me like "Well mom, what do you want I am napping". I did see him like this quite often if I would come in the room. Or sometimes I would see the blankets covering the hole and not see him at all. Here is "Andy" in his cage doing his most favorite thing...eating. I had some real heavy glass coasters that I kept his food and water in. I would weigh the coasters with the food in them before I gave them to him. Then when I removed them I would weigh them again so that I could see how much he was getting to eat. Well, eventually it was time for "Andy" to go outside to an aviary that I had built just for him. It was a large structure that had hardware cloth covering the outside so that he could not get out and no one could get in to harm him. I placed one of my dog kennels with the door removed out there with plenty of blankets, I did not want him to get cold and wanted him to have shelter from the wind and rain. This structure also had a roof on it. There were large logs that I dragged in there and had them secured in so that one would not accidently fall and roll on him and hurt him. He slept in his kennel for several weeks, til one evening I went out to give him his nightly dinner and I looked in his kennel to check on him, which I always did and he was not there. I panicked. I could not see where he had gotten out. When we built this aviary we buried 2X6's in the ground so that he could not dig out. As I stood there crying because I had lost my baby and could not find him, he must have heard me because I soon heard a rustling in the pine straw in a corner of the aviary and out he emerged from under the pine straw. I was never so glad to see anybody in my life. I sat down on the ground and he came up to me and crawled in my lap and I just hugged him and kissed him and was so relieved that he was ok. I got up to check out his new "bed" and he had a nice tunnel dug in the pile of pine straw. So I knew from that, he knew what to do to make himself a place to sleep. I would have never known that there was anyone under that pile of straw. I still kept his kennel in there with clean blankets in case he wanted to use it, sometimes he did, but most of the time he slept buried in the pine straw. Here is Andy eating from his dish. He is in the aviary. I eventually got him stainless steel bowls to eat from and keep his water in. To some people he may look ugly in this picture, but I guess to a "mother" every child is beautiful. He sure was to me. This picture was sent to me by Sarah Rowe in Georgia. Notice his little "hand" at the bottom of the picture, it does almost look like a humans hand. Thank you Sarah for sharing this great closeup of Mr. John Barrymore Possum. Eventually, I opened the door to the aviary and let him go. The area that the aviary was in was fenced in. I have my entire property fenced in to keep out the stray dogs that roam our neighborhood. It also keeps my dogs at home too. But the big fence is divided into 3 sections. There is an area that my dogs have access to that is next to the house. Then there is the section that "Andy" was in, then there is a back section that my squirrel aviary is in. The section of fence that separated his part from the house did have a gate in it so that I could access it easily. There were also 2 dog houses in the section that I let him go in and I had put pine straw in both of them and it did not take him long to find one and move in. I continued to put his food out for him every night. I figured that eventually he would climb the fence and be on his way. But that never happened. He continued to stay here. One night I went to let the dogs out to go do their business before going to bed and to my surprise there stood "Andy" on the deck. I could not believe it, he had climbed the fence that separated his section from the section that the house was in and was on the deck. Needless to say I did not let my dogs out at that time. I went outside and got him to follow me thru the gate back to his section so that I could let my dogs out. I had no way of knowing how my dogs or how "Andy" would react if they came in contact with each other and was not going to find out. So every night before I let my dogs out after that I had to go search for "Andy" to see where he was before letting them out. Well one morning a couple of months after that, I went and checked on "Andy" to make sure he was in his bed so that I could let my dogs out and he was in his dog house asleep or so I thought. I let the dogs out and went back 5 minutes later to let the dogs back in and I was horrified by what I saw. There stood my Shelties and "Andy" was standing under my male Sheltie "Krys". He was standing there like he was one of the dogs and waiting to come in with them. I quickly got my dogs in and then proceeded to lead him back to his dog house. I could not believe that the dogs did not even pay him any mind at all. That was the last time that ever happened. I was really more careful after that. I did get to see "Andy" climb the fence on several occassions and he did it quite well. One day when "Andy" was about 1 1/2 years old, it was in the summer during the middle of the day and I had gone outside to let the dogs out and I saw "Andy" climbing over the fence. I immediately put the dogs up. He came right up to me and I knelt down on the ground. I knew something was wrong for him to be out in the middle of the day. I started to pet him and ask him what was wrong, like he could tell me. After letting me pet him for a little while, he proceeded to go under the deck. Well our deck is not that far off of the ground, but I managed to squeeze under the deck laying flat on the ground so that I could go after him. He found him a cool spot under the deck and laid down. I knew at this point that something was wrong and I laid there and talked to him and told him that I loved him and it was at this time that he died. My heart still breaks to this day when I think about day. I know that death is a part of life, but it is still hard to accept. I picked him up and got him out from under the deck and proceded to dig him a grave to be buried in. I wrapped him up real good in his blankets and said several prayers over him and asked God to look after this wonderful creature that He had allowed to come into my life. I went and got a real pretty concrete angel to put on top of his grave so that "Andy" would have someone to watch out for him. I know that "Andy" is in a better place now and I still miss him, but I will never forget my experience with him. I am thankful that what time he had here he spent it with me and I hope that he was happy here. I have the belief that one day I will get to see him again and I will get another opportunity to hold him and tell him that I really did love him.